Belly putters are often used to correct the "yips" or gain more consistency on the putting surface. Belly putters are a style of putter in which the putter is extended beyond the hands that are holding the putter, so that the end of the putter nestles in against the belly of the golfer using the putter. As with all designs, belly putters will work for some players while others will prefer different styles, with trial the best way of finding the best fit. As the name of the putter implies, a belly putter must be long enough to reach to the belly of the player that will be using it on the course. This is not a matter as simple as having a player stand up straight and measuring the height of their belly, however. Instead, a player should use a standard putter he is comfortable with to find the preferred putter angle. While gripping the putter, a partner measures the distance from the ground, up the shaft and to the golfer's belly. This is the length the belly putter should be cut to. Gripping a belly putter can be accomplished with a number of grips, just as a golfer can use with a standard putter. As a putting stroke travels in a much smaller arc than the stroke with other clubs, a putter can be gripped in ways thay are not practical for full-length clubs. To hold a belly putter, the golfer uses the putting grip of choice, then bends over the ball so that the extension of the putter nestles into the belly of the golfer firmly without applying uncomfortable pressure. The yips is a name used to describe a golfer struggling to make short putts, often considered "automatic" putts. Phil Mickelson famously struggled with the yips early in his career, before rectifying the problem. Changing the type of putter in a bag is a common trick for helping to combat the yips, as a new putting style changes up the muscle memory behind putts, and a belly putter may help a player with a standard putter beat the yips. One of the strengths of the belly putter, which plays a role in its effectiveness with the yips as well, is the ability to have a more consistent stroke. A golfer suffering from putts pushed or pulled, meaning the ball strays from the target line immediately off the face of the club, can potentially reduce the problem with a belly putter. By anchoring the tip in the belly, the putter provides a fulcrum to pivot the club around, making it easier to create a straight pendulum motion along the target line. Full-length putters are the next step up from belly putters, for those who struggle with standard and belly putters. 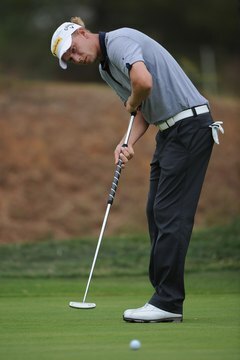 While the belly putter extends the shaft to the belly, full length putters extend all the way up to the chest of the golfer, and require a unique grip to hold. One hand is taken off the shaft at the "standard" height and moved up to hold the top of the shaft against the chest.